We are going through an experience called life. I’m interested in how people are navigating the journey. Exasperated! Angry! Disgusted! At your wits end! In our world today our lives are chaotic at best and often reflect the world around us. This is a space regardless of faith, race, nationality, age, family status or gender for the discussion of the individual’s spiritual journey. This is a journey of how we come to terms with ourselves, develop our strength and find inner peace. Join me, and share in the adventure. Many Meals for 500 weeks! The Wednesday Night Many Meals program at First Presbyterian Church in Santa Paula recently celebrated its 500th week. 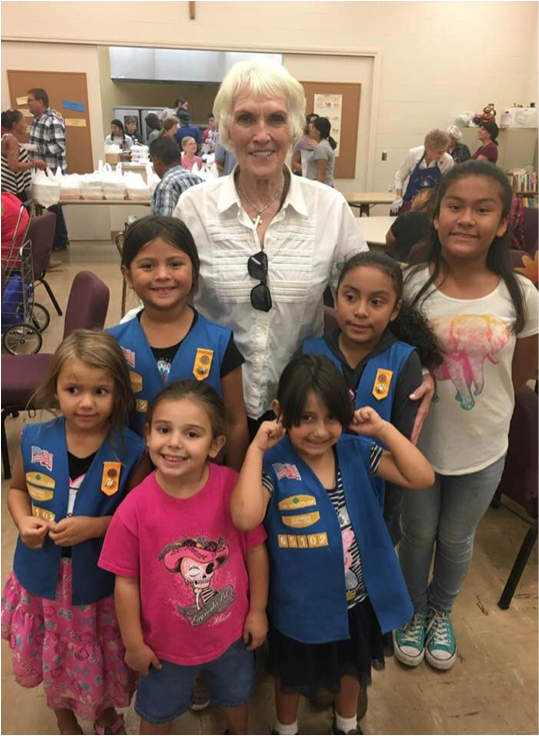 The outreach program was started by a group known as the Spirit of Santa Paula, which quickly outgrew its home and moved to the First Presbyterian Church. Serving between 500 and 600 meals each week the guests include the lonely, the elderly, the needy, children, farm workers and people trying to make meager incomes stretch between paychecks. Shown is Kay Wilson-Bolton, one of the hardworking Many Meals volunteers and her friends on a Wednesday evening. They are perfect examples of God’s lights shining in the darkness. We do good work not to earn our salvation. We do good work because we are already saved. God expects us to be part of the world around us, helping where we can and encouraging people to reach their full potential. It is through our good works that we become God’s lights shining in the darkness. The September message is from Matthew 5:14-16 where Jesus tells us to be lights shining in the darkness. Yesterday, December 2, Christian churches focused on a circling of greens with four or five candles near the front of the church. They read scriptures or recite prayers as they lite the Advent Wreath celebrating the first of the four Sundays leading up to Christmas. The Christian church year, like our calendar year has seasons. The year begins with Advent, four weeks before Christmas and ends with Christ the King Sunday (the Sunday before Advent). The Easter Rising took place during the week of Easter 1916 with 2,000 Irishmen opposing about 25,000 English regulars. The following week on May 3 the first of the freedom leaders was led to this corner of the courtyard. P. H. Pearse was blindfolded, bound and placed to stand facing into the courtyard with a target taped over his heart. A dozen soldiers recently drafted into the British Army (making them in their late teens) were given rifles (one of the rifles held a blank) and were marched into the center of the courtyard. Facing the accused, the first six dropped to a knee and the other six stood behind. At a signal from their commander, all 12 fired at P. H. Pearse. Over the next 9 days, 13 more of the uprising leaders faced a firing squad. What is so valuable that a person willingly gives up his life? That was my thought standing in the outer courtyard of Kilmainham Goal. A gentle mist settled over us lending a mystic other worldly atmosphere to the setting while the tour guide described how 14 martyrs quietly gave their lives for Ireland’s freedom from England. We respect your privacy and any information received from you will not be shared without your written consent. Please, if you do not want to comment on one of the posts, take a moment and drop me a line. I look forward to hearing from you. Your contact information will not be shared with anyone else. Thank You.